Aww no more being on the front page of LJ for my blog! It will be nice on my inbox to have a wee bit of a break though! I’m really happy that my last quarter is done for classes- don’t really want to know how I did though! In all seriousness, it should be fine- 8 of the 18 credits at least will be good. Now, I get a bit of a chance to take a break- which really means I am teaching classes, going to doctors appointments, getting my car fixed, and trying but failing to catch up on sleep. While sorting through some yarn, I found my aloo! 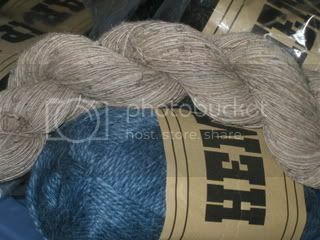 Made from nettles, Aloo is a coarser yarn best used for outerwear and washcloth type objects- though like linen it does get a fair bit softer with washing and use. Aloo is a bit hard to find in LYS’s, so I made sure to snap some up last time we got a new order in stock. Hanging out with the aloo is Hemp, a hemp and wool blend of yarn. I’m using it for a sweater, though the main color of my sweater is black. I have to rip it out though, since I’m not quite happy with the gauge I am getting now.